Kawasaki Engines unveiled the FT730V-EFI engine and its accompanying air filtration system. The FT730V-EFI employs the 730-series engine block and features vortical air filtration (VAF), an air-intake methodology that focuses on getting clean air into the engine without also introducing external debris, such as loose grass clippings. Benefits of VAF include longer engine life, improved cutting performance and reduced maintenance as the prefilter and filter can run for up to 50 hours before requiring cleaning, according to Kawasaki. The air intake system uses centrifugal air movement to move heavy grass, dust and debris away from the air filter. It then ejects accumulated debris out of the engine through a duckbill debris ejection valve. 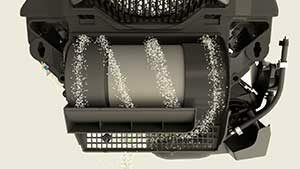 Once the ejection process has been completed, only fine dust is left, which gets trapped in the filter. Grass entering the cooling air path system under normal mower use can be removed through the large clean-out ports located over the cylinder heads. The cover for these clean-out ports is integrated into the VAF cover. The FT730V-EFI system also employs an integrated electronic governor that immediately adjusts the engine’s power-to-load ratio for maximum cutting power at higher speeds, cleaner mowing in heavy turf and minimized need for recuts, Kawasaki said. Kawasaki’s single, sealed electronic control unit is protected to avoid exposure to weather, dirt and vibration. The open loop design avoids the need for an oxygen sensor and maintains low engine temperatures, which, in turn, reduces oil consumption and contributes to a longer engine life, Kawasaki said.